in addition to the conventionalcontrol of slip ratio, aiming more correlation to the real tires. 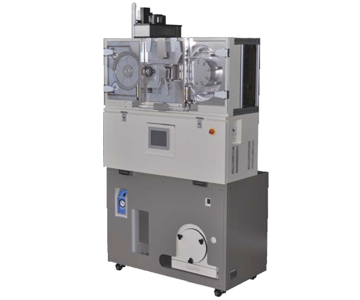 A Lambourn abrasion tester or conventional FPS tester, which is used for abrasion tests of high polymer material for such products like tire and belt, controls slip ratio or speed difference between test piece and abrasive wheel while doing an abrasion test. It was necessary to repeat tests with different conditions in order to evaluate abrasion vs friction energy, which is deemed to have more correlation to the real tire. The FPS abrasion tester enables to reproduce conditions of real tire more precisely by directly controlling the friction force. Friction force regulation tests which were not available with conventional abrasion testers. Real-time measurement of test piece diameter for feed-back of the circumferential speed. Simplified test piece transport system using the swing arm. Improved test piece clamping system with a ratchet. High repeatability of test conditions with Safety Walk used as abrasive. Fully automatic tests of 56 test pieces (50mm dia). Two brushes clean the surface of the abrasive wheel to keep the conditions constant. Friction energy analysis available with the exclusive software.